Most of the time, when you want to clean something up, the last thing you should do is ignore it. Messes have a habit of multiplying when they're out of sight. Check your email after a week's vacation, and you'll see exactly how inattention can make a problem bigger. But now, thanks to Inbox, ignoring spam messages can help keep your inbox clean. 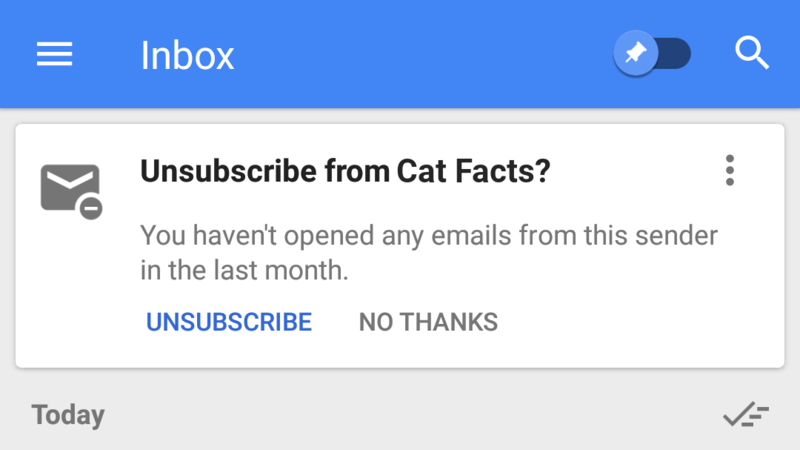 Inbox now asks if you'd like to unsubscribe from a sender's mailing list if you ignore their emails for a month. 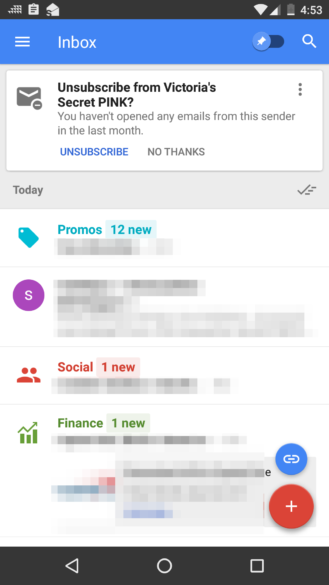 The new feature works via a new "Inbox Tip" card that appears at the top of your inbox in both the Android app and desktop site. All it does is ask if you'd like to unsubscribe from a specific sender's emails, with buttons to unsubscribe or to ignore the tip. Although we haven't seen this feature live on any of our personal devices, we've received tips from those seeing it on both the desktop site and Android app. We aren't sure exactly when this started rolling out, but it appears to be new. It could be that the feature hasn't reached everyone just yet, or that we're just too good here at AP when it comes to managing torrents of spam on our own. Presumably, this feature should only work for messages that Google is able to identify as promotional content with an option to unsubscribe, so it might not work for all types of promotional messages.